There are easy and enjoyable ways to protect ever-growing needs to protect our food sovereignty, and growing cucumbers is a great way to start. Of course you’ll want to make sure you are using heirloom, organic, non-GMO seeds to experience the most pure health benefits of cucumbers. Once you get started, you can either grow cucumbers in a pot and allow them to climb a few bamboo stakes, or similarly plant them in a garden. 1. Being 96% water, cucumbers are great for keeping you hydrated. 2. Cucumbers relieve heartburn and hot skin after sunburns or just spending the day in the sun. They are also full of skin-lavishing minerals like magnesium, potassium and silicon, and are used in spa treatments all the time for this reason. 3. They flush out toxins effectively, and may even help dissolve kidney stones. 4. Cucumbers are full of antioxidants – especially vitamins A, B, and C that boost immunity and give you more energy when you are feeling lethargic. 5. 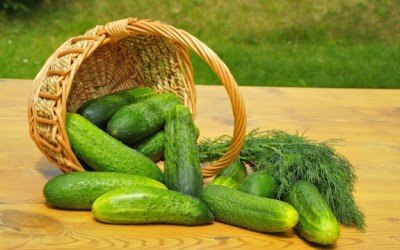 Cucumbers can help you lose weight by offering great nutrition and high-water content. 6. Slices of cucumbers on the eyes can reduce puffiness and redness. 7. Several studies show that compounds in cucumbers help to fight cancer. 8. They stabilize blood pressure. 9. They refresh the mouth and gums, while even healing diseased gums. 10. Cucumbers aid in digestion due to their fiber and water content. 11. Silica is great for the hair, nails and skin – so cucumbers are a beautifying food. 12. Cucumbers can soothe joint pain due to their high levels of antioxidants. 13. This great food lowers uric acid levels, making it a potential solution for those with gout. (Check out other home remedies for gout here). 14. Cucumbers support the pancreas for insulin production, so they are great for diabetics. 15. They reduce bad cholesterol due to the presence of plant sterols. Growing cucumbers is fun, boosts self-sufficiency, and healthy. The vines are beautiful with sprawling green leaves and curling tendrils before the cucumbers form. They yield an abundant crop when cared for properly, too. Cucumbers like full sun and a slightly alkaline soil (about 7.0) that you can add a little compost tea to to really see your cucumbers grow like crazy. Even if you are going to grow outdoors, try growing the seeds inside for about 3 weeks before transplanting, and then you can grow them in full sun. Trellis if you have limited space in which to grow your cucumbers. I love to keep thinly sliced cukes with sliced onions in the fridge with a little homemade dressing mixed in to have for when I have the munchies!! So refreshing. Also sliced in water make a refreshing drink! Cut thin, lengthwise slices of cukes and let them soak in a pitcher of water in the fridge. Makes a refreshing, tasty drink for cooling off during hot summer days! Good substitute for lemonade. Recipe – 2 cue, 2 small pot natural yogurt,half teaspn ginger,cinnamon, turmeric, one tablespn honey. Peel+de-seed cue+chop.Mix all.Whiz in jug-not too much. Fridge for one hour,then into small pots+freeze. Cucumber Sorbet,lovely on hot days. I dislike the taste of cucumbers, but had to find a creative way to include them in my diet. I tried blending the cuke with flavored ice cream. It made a very sweet dessert without obvious cuke taste. This recipe looks like a very nice alternative, though I would still use a blender. Thank you!